My attempt at being healthy has failed me. It’s been a long time since I can remember being excited to eat well. Actually, to be fair, I can’t remember a time I was ever excited to eat well. Sure, I force myself to eat apples as a mid morning snack while at work. Sure, I’ll eat almonds and rice cakes in the afternoon, but if you put a bag of peanut M&M’s in front of my face, I’d choose them every single time over the healthy alternative. That’s just who I am. I can’t hide it. So you’d imagine my surprise when my mother-in-law made a fruit pizza while visiting us a few weeks back. I took one bite and thought I’d gone to heaven. (Just so you know, I’d never tasted the likes of the fruit pizza…) Sister quickly pointed out that the crust of said pizza was made of…sugar cookie dough. Is there anything more brilliant? So the other day, I set forth to make this glorious pizza. And you’ll be happy to know that I snacked on the fruits while making it! I know, total insanity. I even went so far as to chop up extra strawberries to eat with cereal. 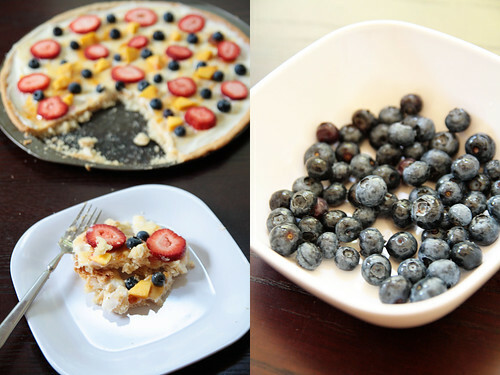 If you feel the need to be naughty but feel like you’re being healthy because there’s the slightest bit of fresh fruit involved…then this recipe is for you. Grease 12-inch pizza pan or spray with cooking spray. Press softened cookie dough into the pan until it forms a crust. Cool pizza completely, about 30 minutes. *Heat jelly over low heat, adding water. Bring to a rolling boil. Set aside. Spread cream cheese mixture over cooled crust. Spread apricot jelly/water mixture on top of cream cheese mix. Arrange fruit to top it off. *You can omit this step if you like and just spread the jelly over the cream cheese, but I wanted a slightly less thick version. Now you can almost feel good about your dessert choice. I haven’t had this in ages. Forgot what a simple, but super awesome treat it is. Wow. That looks amazing. I will be making this week! Brilliant! Sugar cookie dough as the crust? Love it! ha! nah…he just happened to be napping. don’t you worry…you’ll be doing the same thing. beautiful recipe! looks amazing and I am sure it tastes even better! Oh, that is some craziness right there! If you were in a hurry, you could just use cream cheese frosting in a can! Don’t mind if I do! Congratulations on your little bundle of love! This is adorable and sounds delicious! What a cute idea! I’m craving some right now. So dangerous. Delish- and pretty! Love the colors/fruits you chose. And a sugar cookie crust? YUM! oh that sugar cookie crust is what puts this dessert over the top. and it’s so tasty. you’re so right! kids would love this. cookies. fruits. and icing. perfect fun! It’s such an easy dessert to make too. Such a perfect summer dish. So great for this weekend! 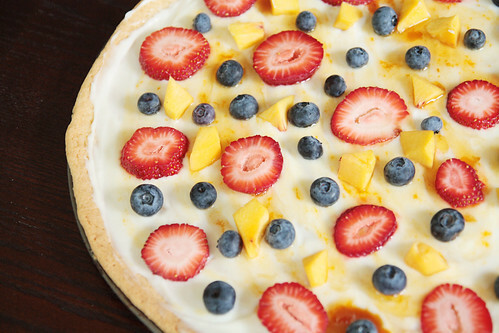 This looks so good, I love fresh fruit in desserts. And a sugar cookie crust really is brilliant! Click it, you know want to!